Expand your motion capture pipeline with the new Insight VCS, a comprehensive virtual camera system for capturing and streaming live, real-world camera moves into MotionBuilder or Maya. Supported data sources include OptiTrack as well as third party systems such as Vicon and Motion Analysis1. In addition to enhancing your animation’s realism, using motion capture to drive your virtual camera reduces production workload significantly. Mocap offers rapid content creation, real-time visualization, and greater creative control over your animation, enabling you to create content quickly and affordably. Introducing the S250e Mocap Camera—Engineered for High Performance. 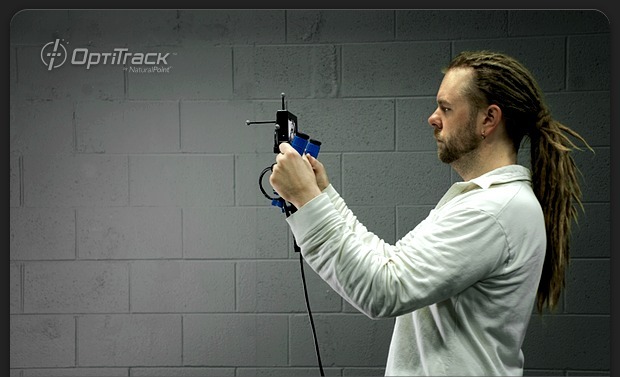 OptiTrack’s newest motion capture camera, the S250e, is now officially shipping to customers worldwide. Enjoy OptiTrack hallmarks—like robust construction, super efficient on-camera image processing, bold industrial design, and excellent performance at an unparalleled price—along with a host of advancements in tracking and ease of use. No other camera in the world offers an equivalent feature set at such a affordable price. Equip your S250e camera with the M12 lens of your choice, optimized according to your tracking needs. Options include the stock 5.5mm lens for expansive field of view or the 8mm lens for maximum resolution. Both lenses are specifically engineered for motion capture, including anti-reflective coating, very low distortion throughout the camera's view, and image circles specifically matched to the camera's sensor. How does the S250e stack up? We’re excited to announce a new partnership between OptiTrack and the Pixel Corps, a collaborative guild for a new generation of digital craftsmen.The Pixel Corps offers in-depth training for 2D and 3D digital arts by of some of the top minds in animation, 3D modeling, VFX, motion graphics, and general CG design. Currently the Pixel Corps team is expanding their emphasis on motion capture, and are inviting OptiTrack users to join in. Sign-up and get 40% off the regular price of $99/year when you enter the coupon code "OptiTrack2010." This offer expires on February 28, 2011. Support for non-OptiTrack systems only available via the Universal plugin to MotionBuilder. Specifications obtained from Bonita product brochure. MSRP obtained from official Vicon quote.